The reproduction side of things however, can sometimes cause an issue…especially if the result is a colony of bats in the home. Two Ohio bat species will commonly share living space with humans; the little brown bat and the big brown bat. The females of both of these species form maternity colonies (these colonies range in size from 50 to over 100 females) in which the females birth and raise their young together. In their natural habitat, these maternity colonies would be found in hollow trees or under peeling bark. But the little and big brown bats have discovered that human structure also provide good habitat. Natural places for bats to roost are in hollows of dead standing trees, tree cavities, or under loose bark (like this little brown bat is utilizing). 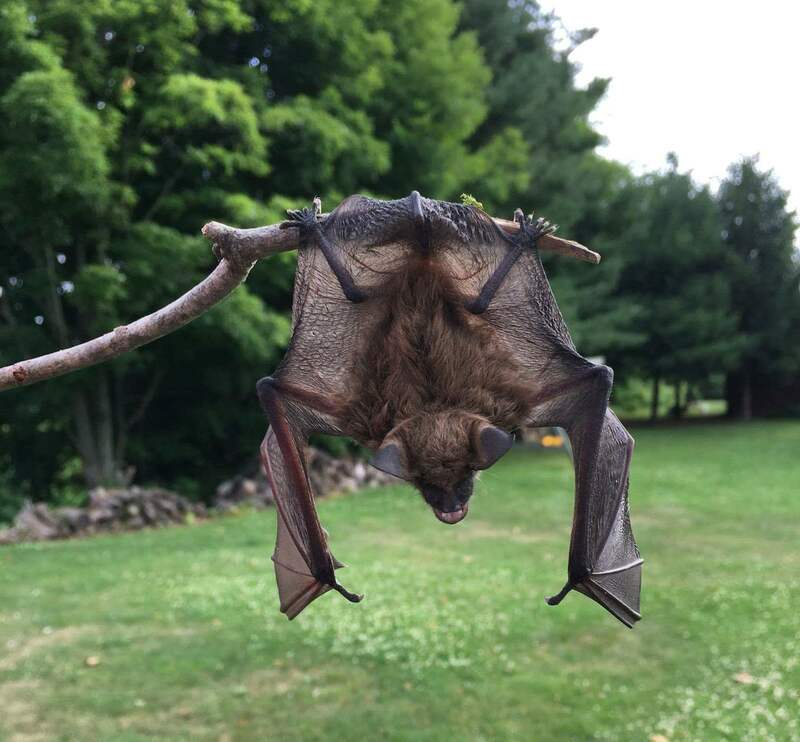 It is possible to remove bats from a home with a bit of work and patience. The most effective way is exclusion, which involves identifying where the bats are entering the building and covering those access points with one-way exclusion devices. These devices allow bats to leave the building but not reenter. Patience is required to wait for the young to be able to fly on their own. If exclusion takes place before the young can fly, the mothers will be excluded and the young left inside to die. Therefore, excluding a bat colony in Ohio should never take place between May and August! This time of year, new young of the year are testing out their wings and learning to fly. That means if you have a colony of bats in your home, towards the end of July into the early part of August you may notice a few more bats in your home than usual. These young bats haven't quite keyed in on their navigation skills, causing them to take a wrong turn that leads to your living room instead of outside! Above is a baby bat (called a pup). Do not handle bats unless it is absolutely necessary (in the case above, the young pup needed help returning to its colony). If you must handle a bat, be sure to wear thick work gloves to protect against bites. Photo courtesy Kim Baker. Bat exclusion professionals are available for hire, but do-it-yourself instructions can be found here: [ http://www.batcon.org/pdfs/binb/ExcludersGuidelines2014.pdf ]. The biggest challenge if doing-it-yourself is identifying all the access points bats use to enter and exit a building. This often involves roof access and can be dangerous. For a list of wild animal control operators by county, some of which exclude bats, see: [ http://wildlife.ohiodnr.gov/Portals/wildlife/PDFs/Licenses%20&%20Permits/CNWACO%20Current%20License%20Holders.pdf ]. This small maternity colony of tri-colored bats lives in the nature center of one of Ohio's state parks. Many times bats share space with humans without issue. Photo courtesy Kim Baker. Maternity colonies will return to the same place year after year to reproduce. If they are excluded, they will need to find another place to roost and their ferocious appetites will go with them. Consider putting up a bat house to keep them in the area. Bat house plans and instructions on where best to place them can be found here: [ http://www.batcon.org/resources/getting-involved/bat-houses ]. Bat houses are a good way to keep bats in the area after an exclusion has taken place.